At HOUSE Automotive, we’re easily “wowed” by the sleek aesthetics and heart-racing performance of Porsches both classic and brand new. You’d think that we’d get used to the allure of these German sports cars because we deal with them on a daily basis. The truth, however, is that we’re still constantly impressed by what Porsche puts out every single year along with the Southern California Porsche community in general. In a move away from your typical Porsche appreciation post, today’s blog is dedicated for Panamera owners because we’re going to highlight several of the interior and exterior features of the 2017-2018 Panamera (it’s a heck of a car and some of these features are seriously impressive!). Many Panamera owners choose HOUSE Automotive for independent Porsche service in Los Angeles and we’re happy to cater to them; we make service for Porsche Panameras easy. Questions? We’re always here for you. With Surround View, you’ll get a birds-eye view of your Panamera on your screen. The system indicates if there are any nearby objects that may threaten or touch your vehicle, but these notifications can be turned off so not as to annoy you. ParkAssist, as you could guess, helps you back or pull into a space between two cars and gives you a live readout of your angle and how to turn your wheel to park your vehicle perfectly. Unfortunately, it won’t go into autopilot and park for your car for you, but that technology certainly isn’t unheard of. Are you ever frustrated at how most car doors only stay put at about three predetermined positions when you open the door? With variable door stopping technology, the Panamera’s doors will stop at whatever angle or position they’re swung out at. In addition, soft close doors make slamming your car’s doors a thing of the past, though you’re always welcome to do that if you’re feeling particularly angry while getting groceries. Simply bring the door to a soft close and the system will properly seal the doors on its own. Gone are the days of headlights and taillights simply turning on and off. Though all you have to do as the driver is simply switch your headlights to the “AUTO” position, PDLS, or Porsche Dynamic Light System, will take care of the rest. The headlights automatically swivel in the direction of the curve that you’re turning in so as to illuminate the road more clearly. With high beam assist, you’ll never have to worry about turning your high beams off when another vehicle is approaching in the opposite direction as the system will do it automatically. There’s a good amount of bells and whistles in the back of your Panamera to the extent that you may just want to hire a driver to take you around town. There’s no middle seat in the Panamera either because that’s where the climate zone features are. Not only can you cool and heat each rear seat individually, but you can adjust each temperature zone down to single degrees. The built-in touch screen allows you to select what media source your Panamera is playing as well. Looking to escape the outdoor heat or just have a little more privacy in the back seat? With the simple touch of a button you can summon or retract the rear roll-up blinds. That’s fancy, but also practical. We like it. Porsche wouldn’t be Porsche without giving the driver a multitude of drive mode and chassis settings to work with. Controlled either through the steering wheel or the main touchscreen, you can select between normal, sport, or sport+ mode that affects the firmness and overall responsiveness of the ride. You can even adjust the height of your Panamera’s spoiler and the ride height of your suspension. Heck, you can even change the exhaust note with the touch of a button. It doesn’t get much easier than that. If you’ve ever thought to yourself, “I sure wish I had a car with 3D map capabilities,” then you’re going to be happy because the PCM 4.1 Navigation built into most Panameras does this as well as route guidance, real-time traffic updates, easy-to-set POIs (Points of Interest), and much more. Just make sure to spend most of your time at the wheel looking at the road and not the screen in front of you! If this blog post wasn’t enough to familiarize yourself with the techy features of your Panamera, or you’d like to know more about the features of a different Porsche model, there’s an app for that. The Good to Know App is an Android and Apple app that neatly lays out just about everything you’d want to know about your vehicle as well as how to use your interior features. How convenient is that? Our passion is your passion and we treat your vehicle like it’s priceless. It’s a Porsche so in all honesty, it is priceless to us! Maintain your Panamera’s warranty while skipping the typical dealership upcharges for standard service. HOUSE Automotive can and will take care of you and your vehicle! 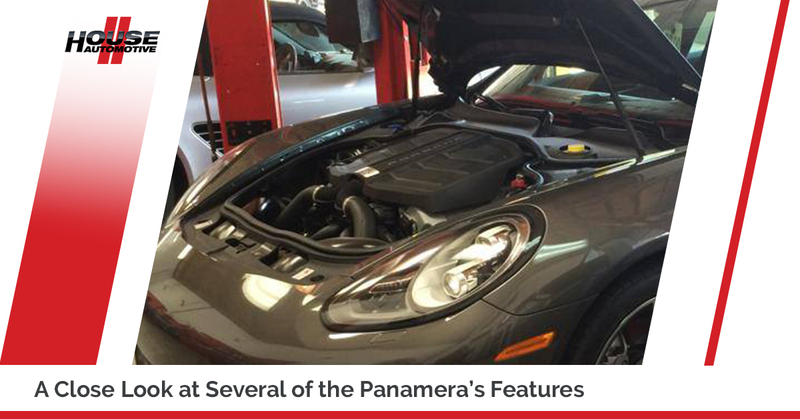 Schedule an appointment for Panamera maintenance today.